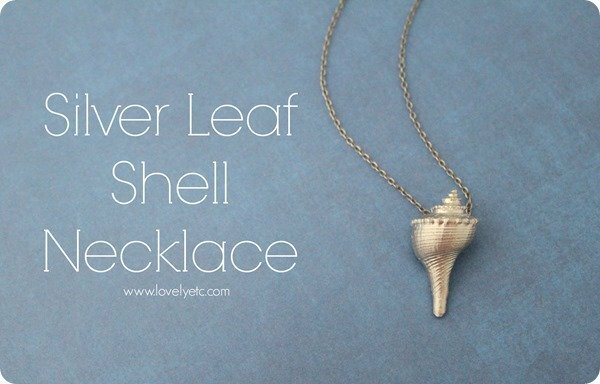 Silver Leaf Shell Necklace - Lovely Etc. 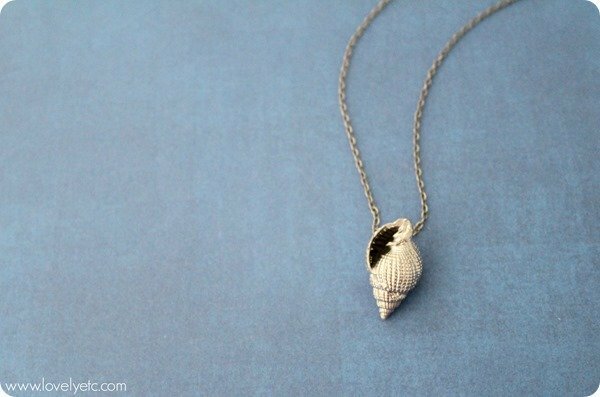 This DIY silver leaf seashell necklace is super easy to make and looks beautiful. It makes the perfect souvenir from your beach trip or gift for a friend. I have a massive collection of seashells I have collected over the years. I’m pretty sure it’s a treasure hunting thing. The same part of me that loves chasing down the best finds at yard sales, also gets a thrill from finding beautiful seashells. It may just be physically impossible for me to walk down a beach without searching for the seashells. 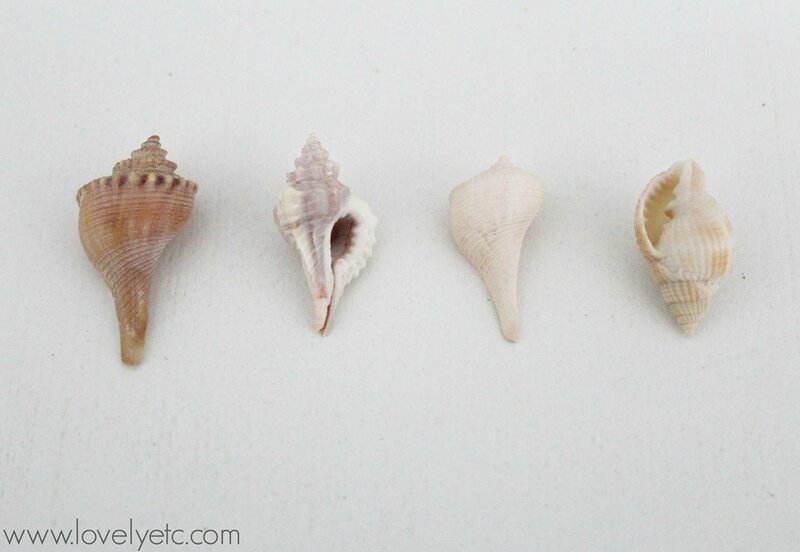 Which means every summer I come home with all of these gorgeous shells…and no idea what to do with them. I am particularly always trying to figure out what to do with itty-bitties. I have some of the most perfect, gorgeous seashells that are no bigger than the end of my little finger. They are marvelously tiny and perfect but I can’t exactly set them on the mantel seeing as how they are a half inch tall. In a couple of weeks I am headed to the beach again (and I am soooo elated about that). I know when I get there I am going to be on the hunt for more shells so I figured it was a good time to figure out a way to use some of the ones I already have! They are the perfect size to make some shell jewelry, but I didn’t really want the hippie vibe a lot of shell jewelry has. I decided to keep it classy and simple with some simple silver leaf shell pendants. Choose your shell (or shells) and clean it throroughly. 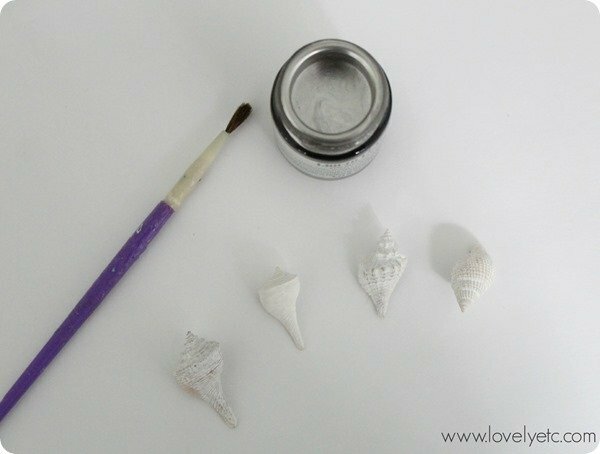 Seal your shell by brushing on some sort of sealer or simply painting it any color. Allow the paint to dry. Use a soft bristle paint brush to paint the shell with liquid silver leaf. Allow to dry. Use a clear spray sealer to seal all of that silver finish in. Use glue to attach a pendant bail to a flatish spot on the back of your shell. 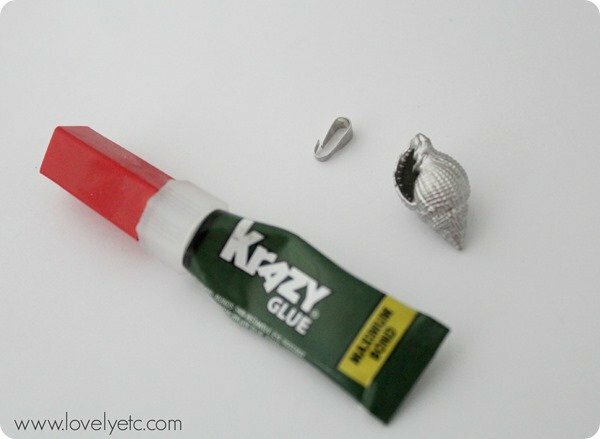 (Some people drill holes in their shells to make jewelry but since I was using very tiny shells, I was afraid drilling would destroy them, so I chose glue instead.) My pendant bails were a slightly different color from my silver leafed shells, so I decided to paint them with the liquid silver leaf as well. Once the glue has dried, string your shell onto your chain. I think shells are gorgeous in their natural finish, but I am really loving how classy these silver leaf necklaces look. I may or may not have started walking around the house looking for more things I can silver leaf as soon as I finished these! Nothing is safe! Like this project? Pin it! 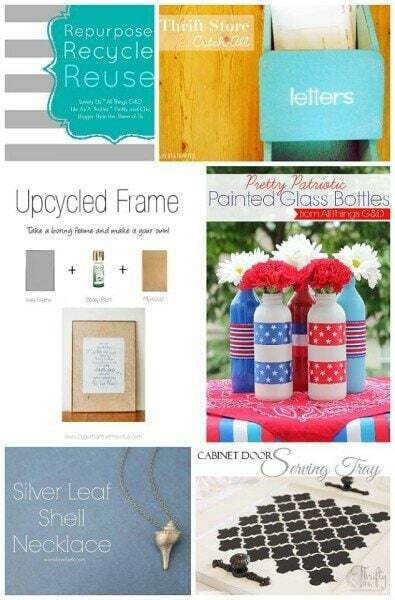 Want to see more shell ideas (that are totally un-tacky)? I’ve gathered all of my favorite shell crafts right here. And it’s time for another round of Repurpose, Reuse, Recycle as well where my friends and I each share a repurposed project. I was questioning whether this really qualified as a repurposed, recycled, or reused project at first. But then I realized that when you really think about it, I reused a little sea creatures former home as jewelry to make me feel pretty. Definitely seems to count to me! 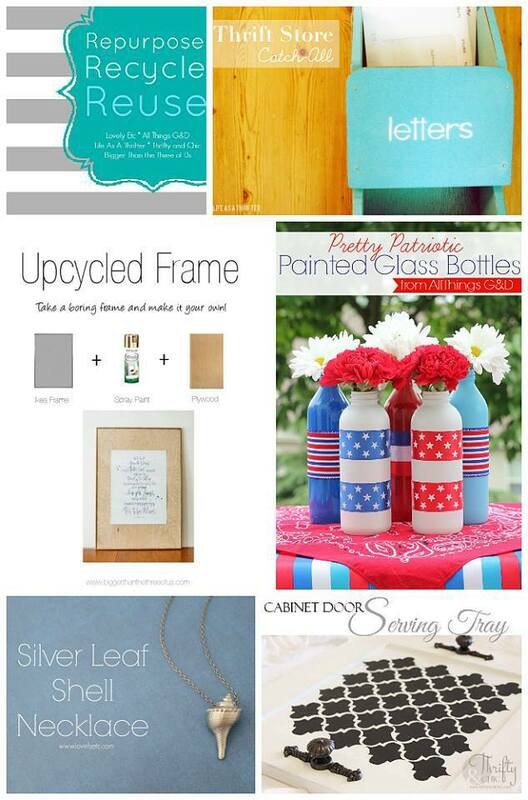 Be sure to check out my fellow bloggers’ repurposed projects – as always, there are some genius ideas in here. Be on the lookout for more seashell projects from me in the future. And if you have done something cute with seashells, I’d love to hear about it – always looking for inspiration! This necklace is perfection for your upcoming beach trip, Carrie – so beautiful! Thanks Dusty! I will definitely be sporting it there! Beautiful use of your collected sea shells! I would love to know which beaches you like to go to, especially which ones you have found the best sea shells. I love collecting them too and have been thinking about planning a trip to Florida in the next year or two specifically for sea shell hunting. 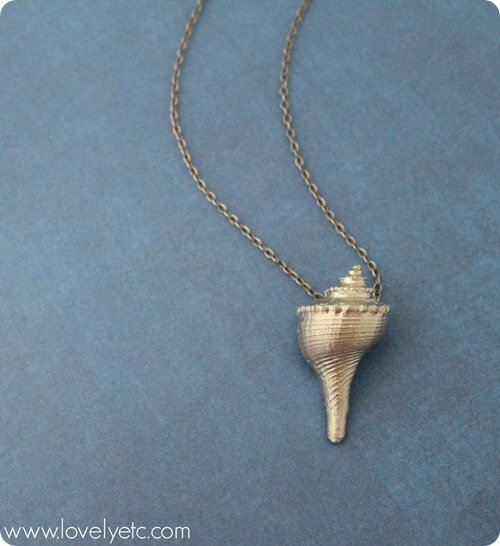 This summer we are going to Sanibel, FL which is supposed to have amazing shelling. I’ll have to report back on how it goes! Thanks girls! 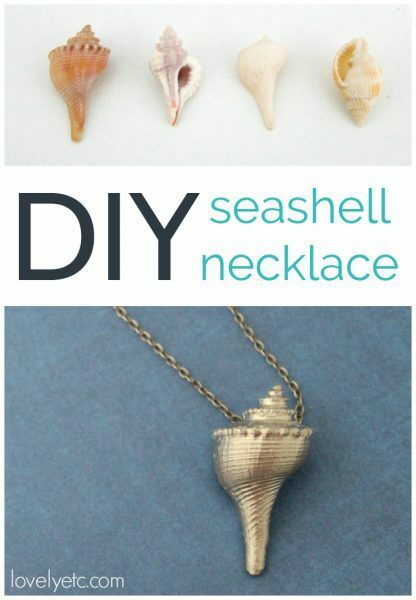 I’m loving how these cute little necklaces turned out – and so glad I found a use for at least a little of my seashell hoard! My step-daughter and I made a mobile from two pieces of driftwood which we overlapped into an “X”, then we drilled holes in sea shells and sand dollars and used fishing line to suspend strings of shells and bits of sea glass. It was so pretty. I bet you could make a beautiful one using the silver shells as well. I have a giant hoard of sea shells as well, many inherited from my mother. I put lots of the really colourful and sculptural ones in a blue bowl that is shaped like a leaf, that has a mended crack in it so it’s not useful for many other things. It’s on my bathroom windowsill and my perfume bottles stand amidst the shells. The mobile sounds so pretty! I bet it made beautiful tinkling sounds too! i have baskets and bowls of shells all over too. I just love them and can’t help searching for more every time we are at a beach. what do you think about the carcinogenic properties of the silver paint – and having it worn on your body? is it a danger? I’m not a researcher so I can’t say for sure. But given that the silver leaf was completely dried before use, none has rubbed off, and I do not wear it daily, I am not overly concerned. I would say it is probably much less dangerous than many activities I do daily such as driving or even drinking soda. I love the painted shells.I use a diamond bit and drill holes for a chain to hold shell and glue charms to shell.It makes a nice necklace. Thanks for the tip Sylvia!